I tried both the "dinosaur" kale (Lacinato Kale), and the curly kale. I like the curly kale the best - it spills over the top of the tube, and looks all full and lush. plus - I like to eat kale, and I don't have to wait for three years to eat it! So that I'll remember this for next year: this is 5 plants, planted in a circle near the outside of the tube. That leaves the middle of tube free, and doesn't disturb the rhubarb. Normally, I don't water during the winter, but since there has been no rain, I've been running the irrigation every other day for 3 minutes (in the tubes). The curly kale has had no issues, while the Lacinato kale got eaten by something, and never really filled out. Now, it will interesting to see what this looks like when the rhubarb comes back. I hope it comes back. It did try to bloom last year (definitely NOT a desert plant) but I'm keeping my fingers crossed! Mr. Ripple definitely believes he should be celebrated twice! "This species, or possibly a natural Agave salmiana hybrid, is occasionally seen in Texas and California gardens...always unlabeled. Agave 'Mr. Ripple' makes a 5' tall x 8' wide, rapidly-growing clump with very undulating, broad, blue-green, soft-textured leaves"
Undulating away... and those leaf imprints! He's probably going to have to come out of the tube in the next few years, if this pace of growth keeps up. But for now, he's enjoying his time front and center on the stage! Go visit Pam at Digging to see other great foliage, and see everyone's favorite plants (including flowers!) at Danger Garden. 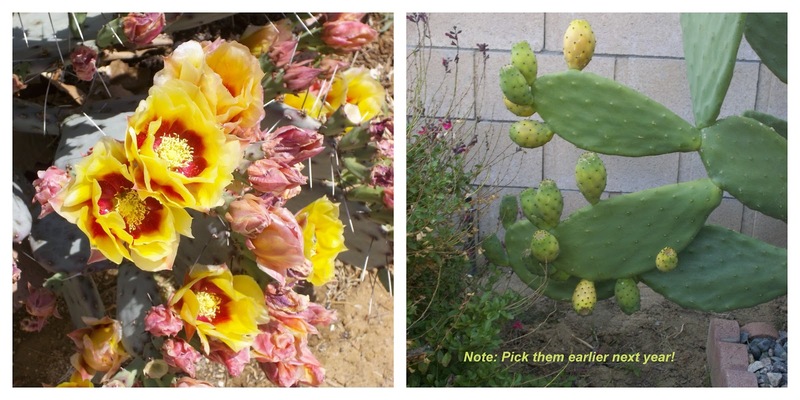 Thanks for providing all these great opportunities to discovery other people's gardens! For bloom day in January, I cheated a bit. I had the opportunity to go to the Huntington Gardens a few weekends ago. The aloes were blooming in the desert garden, and I have to share these pictures. Warning, picture-heavy post ahead... and it was a strangely overcast but bright day, so the light is odd in some pictures. If I were better at photo-editing, I could fix them, I'm sure. But the real show was in the Desert Garden. All the plants were labeled, but I was so captivated by the colors that I didn't make a note of any of the plant names. this a panorama - with the light all messed up. But there were so many aloes, it was amazing. The Desert Garden is one of the oldest parts of the Huntington - some of these planting are almost 100 years old. even un-opened, the bloom spikes were gorgeous. creepy cactus in the background! While I would love to translate some of this into my own garden, I'm not sure I have a hundred years, and we get too cold for most Aloes to survive in the ground. The whole display was amazing... If there is any opportunity to visit the Huntington in January/February, I can't recommend it enough! The barrier around the bottom was put there to deter the neighborhood cats from digging around the plant when I first planted it. It was a lot smaller then. You can visit Loree's comments and see everyone else's favorite plants this week! Heather at Xeristyle has been posting monthly wide shots of her garden at her blog. Go here to see her picture for January, and other people's links in the comments. For this month, I wanted to focus on the hill side in my back garden. Out of all the areas in the back garden, it needs the most work, given that the plan conceived two years ago really didn't work. It had just been weeded, and a new path put in at the top of the hill. All of the plant material that was dead had been removed. There are 2 pine trees (Pinus pinea, Italian Stone Pine) on either end, and 3 fruit trees (peach, nectarine, almond) in between the pine trees. Most of the green, especially near the bottom of the hill, is weeds (oops!). I have started to try a couple of plants (optunia pads, some aloe) but winter is not a good time to plant here, since we get really cold nights sometimes. Also, there's been no rain. 5) maybe some vines for ground cover? The hill gets full sun all day long, especially in the summer, so it's not the most hospitable area. Hopefully, in another few months, this hill side will look way more interesting! 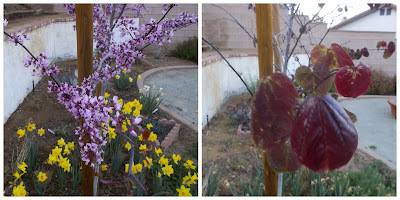 Even though we had very little rain, the Joshua trees all bloomed, and made their funny looking seed pods. I actually did post about this: here We'll see what happens in 2014, given we've still had (almost) no rain. Earlier in the year, I got a chance to explore some of the off-road trails in the area. 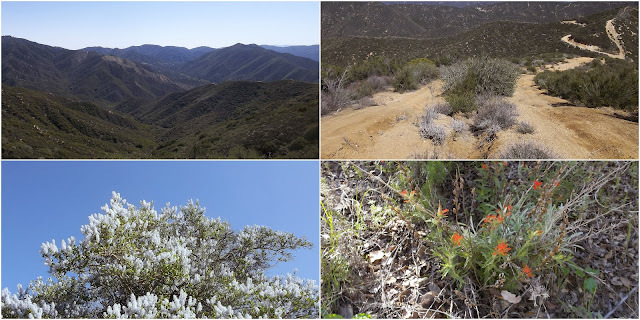 The whole area is gorgeous, and I took a ton of pictures (four shown above). Sadly, in June of this year, the massive Powerhouse Fire swept though the area, burning everything, including several homes. It will be years before the area is reopened. The Optunia macrocenta absolutely exploded with blooms, and I took several pads to plant on the hill side. Over 2 years, this plant has done very well for me. The larger Optunia (Ficus-Indius?) bloomed for the first time, and made fruit! I waited too long to pick them however - remember that for next year! Speaking of optunia macrocentra - here is a my absolute favorite plant combination this year. A red-purple castor bean (grown from seed no less!) growing over the purple optunia. This is definitely a combo I'll have to repeat! I wonder if the castor bean will reseed on its own? We had another super cold winter (due to the same arctic front I read about on other blogs), so this year's plant is definitely toast! I've had a hard time figuring out what to do with this part of the front garden - there are no sprinklers except for the neighbor's irregular overspray, and it's on the north side of the house. I'm not sure the Optunias I have there will survive this winter, with the neighbors still watering their grass two or three times a day, but I think the combination gravel garden will definitely be staying! Out of all the parts of the back garden (which was installed in 2012), the hill side has fared the worst. Finally this year, I got a new gravel path installed at the top, to help keep down the weeds, and cleared all the half-dead plants off the slope. Now, I just need to find things that will grow in full desert sun, with limited water, in mostly clay soil. Should be easy, right? This will be one of the main planting areas for 2014, as I try new plants. Early in the year, I saw this planting bed at Descanso Gardens. 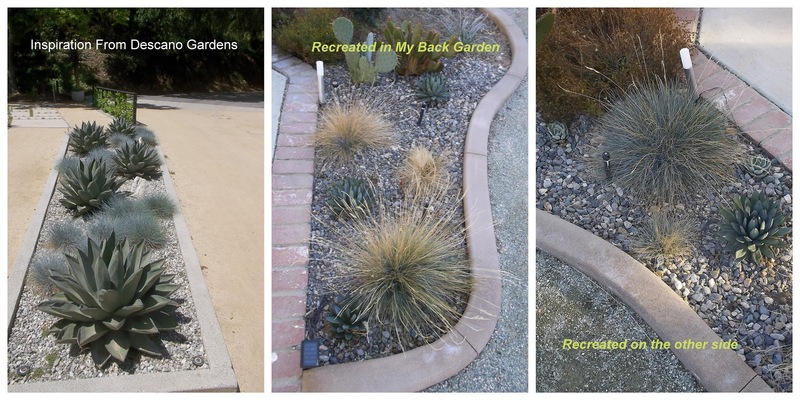 I loved the combination of agaves, grasses and gravel. I recreated in two of my beds in the back garden, using Agave "Shark", "Blue Glow" and "Kissho Kan" with blue fescue grass. Kissho Kan has required winter protection this year, and the blue fescue may need replacing as well, but this combo looked great all summer and fall. 11) I grew things from seed! I know Morning glory is basically a weed in some parts of the country, but I loved this combo of yellow and blue. Especially since I have had very limited success growing things from seed and having them survive, I was very surprised that in 2013, I was able to grow morning glory, castor bean, and several others (including cypress vine, bower vine and Nasturtium). Certainly one of the most interesting things to happen in the garden was that the Manfreda undulata "Chocolate Chip" put up a gigantic blooms stalk with this flower on the top. The hummingbirds had a field day, and now I have a pipe full of pups I need to divide and find homes for. This is another plant that has done very well in the back garden. Now we're on to 2014. I have no idea what this year will bring, but hopefully some rain will be part of it. Happy new year!